We've all seen a million variations of the beloved white fisherman sweater. 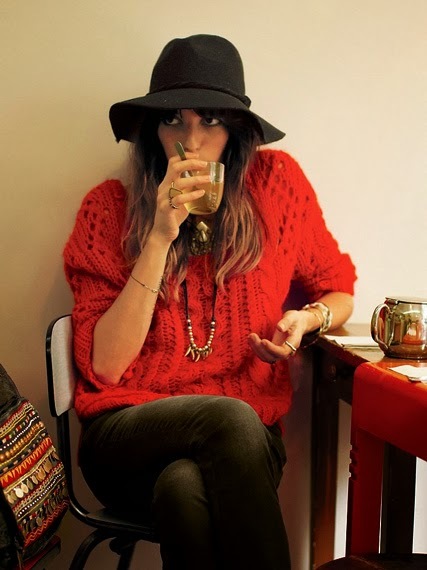 But French chicster Lou Doillon shows us the coolness of the iconic knit in refreshingly different red. (Hers is by Free People, which is sold out everywhere but here.) I also like this one by Warehouse or this iteration by J.Crew (30% off!). I live in New England and was fortunate to have found the Free People sweater at Marshalls. You need to layer it over something for Boston's bitter wind. Great color. Boxy fit. I have a great one and I got mine at a swap meet. These kind of sweaters have many lives and never actually go out of style.